Hello everyone! I hope you all will be absolutely fine and having fun. Today, I am going to explore my knowledge about Introduction to LM317. It is basically a positive voltage regulator having three terminals. It can a supply a current more than 1.5A and voltage in a range of 1.25V to around 37V. You should also have a look at this LM 317 Calculator. For the adjustment of output voltage only two external resistors are required. It has improved standards of line regulation as well as load regulation. Full overload protection e.g. current limiting, area protection can be achieved using LM317. If its adjusting terminal is disconnected, even then all of the protection circuits will work properly. We can also use LM317 as precision current regulator by inserting a constant resistor between its adjustment terminal and output terminal. LM317 has a wide range of applications e.g. constant regulators, battery chargers, microprocessors supplies, automatic LED lightning, Ethernet switch, femto base station, hydraulic valve, IP phone, motor controllers, power bank solutions, power quality monitoring, Embedded Systems etc. 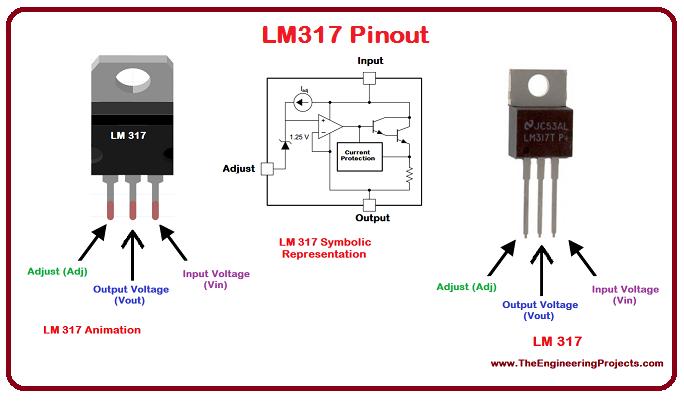 LM317 is a positive voltage regulator with three different terminals Adjust, Vout and Vin respectively. It can supply the output voltage in a range of 1.25-37V and a current more than 1.5A. It has advanced line regulation and load regulation standards as compared to the general regulators. It has a lot of applications in rela life e.g. motor controllers, power bank solutions, hydraulic valve, ethernet switch, battery chargers etc. LM 317 has three (3) pins in total Adjust, Vout and Vin respectively. Each of the pins has its own functions, all the pins along with their name and numbers are shown in table given below. LM 317 pins configurations along with the properly labeled diagram is shown in the figure below. The animated LM317, its symbolic representation and the image of the real LM317 all are shown in the above figure. LM 317 works on a very simple principle. It is a variable voltage regulator i.e. supports different output voltage levels for a constant applied input voltage supply. A variable resistor is connected at its Adjustment (Adj) terminal in order to control the level of the output voltage according to the requirements of the circuit. 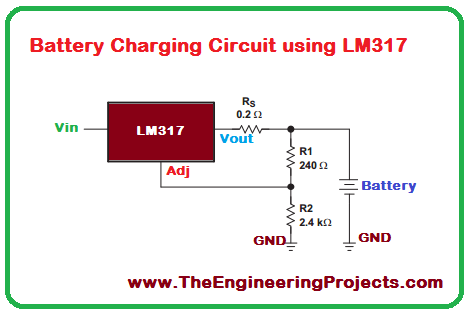 In other words we can say that LM 317 can step down the voltage from 12V to several different lower levels. 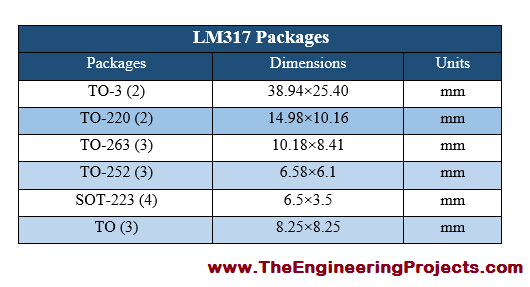 A lot of LM 317 packages and their dimensions are provided along with their System International (SI) units in the table shown below. Description of packages along with their dimensions is given in the table above. 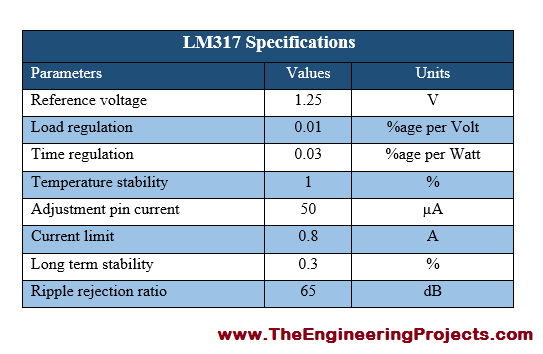 The different specifications associated with LM 317 are provided in the table given below. LM 317 has a very wide range of application, a few of which are given below. Battery chargers, the proper design of the circuit is shown in the figure below. I have made a simulation in Proteus ISIS for voltage regulator. The screenshot of the simulation is shown in the figure below. The running form of the above simulation is shown in the figure below. Input, output and variable resistor are encircled in the above figure. Since its a variable voltage regulator so by changing the value of variable resistor you can obtained different voltage levels at the output. In the above figure, for the resistance of 61% the output voltage is 7.88V. Now, I am going to check the voltage level for the different value of variable resistor, which is 54% in this case. The output of the simulation is shown in the figure below. For the different value of variable resistor the output voltage has also changed from 7.88V to 8.27V. That was the detailed description of the voltage regulator simulation. You should also have a look at LM 317 Voltage Regulator in Proteus. You should also read Introduction to 7805, which is also a voltage regulator and is used to convert 12V into 5V.